Mon, Tue, Thu, Fri7:45 a.m. - 2:15 p.m.
Wed7:45 a.m. - 1:15 p.m.
Mon - Fri7 a.m. - 3 p.m. Lunch after the field trip! Kinder Fun in the Library! 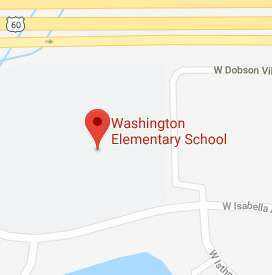 Washington is an A+ School of Excellence! Washington just received news that we have once again been named an A + School! We vow to provide quality instructional programs, create a strong foundation for educational success, place a high priority on quality customer service and student safety and create a welcoming environment that is clearly learning focused. Click here for more details! Don't throw away your dry markers! Send them to school with your child! We are collecting the markers to send to Crayola (FREE!) and they in turn will recycle every bit of the marker and transform them into renewable energy!! Lower your tax bill by making a donation! Click here to pay for student fees and fines.